The official opening of the Memorial Hall, November 7, 1929. 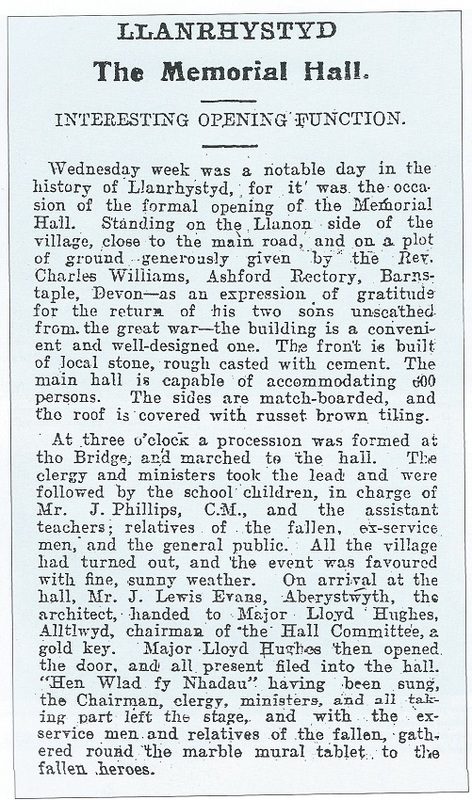 Wednesday week was a notable day in the history of Llanrhystyd, for it was the occasion of the formal opening of the Memorial Hall. Standing on the Llanon side of the village, close to the main road, and on a plot of ground generously given by the Rev. Charles Williams, Ashford Rectory, Barnstaple, Devon – as an expression of gratitude for the return of his two sons unscathed from the Great War – the building is a convenient and well-designed one, rough casted with cement. The main hall is capable of accommodating 600 persons. The sides are match-boarded, and the roof is covered with russet brown tiles. At three o’clock a procession was formed at the bridge, and marched to the hall.  The clergy and ministers took the lead and were followed by the school children, in charge of Mr J. Phillips, C.M., and the assistant teachers; relatives of the fallen, ex-service men, and the general public. All the village had turned out, and the event was favoured with fine, sunny weather. On arrival at the hall, Mr J. Lewis Evans, Aberystwyth, the architect, handed to Major Lloyd Hughes, Alltlwyd. chairman of the Hall Committee, a gold key. Major Lloyd Hughes then opened the door, and all present filed into the hall. “Hen Wlad fy Nhadau” having been sung, the Chairman, clergy, ministers, and all taking part left the stage, and with the ex-service men and relatives of the fallen, gathered round the marble mural tablet to the fallen heroes. Llanrhystud Heritage Trail Guide now available!! !